Born July 10, 1856 in Smiljan, a small village in Croatia, Nikola Tesla was the discoverer of the Alternating Current(AC) power system. His other contributions as an inventor are to numerous to mention here, I'll just give a few. These contributions include hydro electric generators, the AC power distribution system we still use today, the X-ray machine, MRI, the discovery of a rotating magnetic field, Radio and much, much more. His most popular invention was discovering how to harness the power of Alternating Current. The Two Phase Alternating Current induction motor. The above video capture depicts the Tesla wireless transmission of electricity. The area in which you see a spark(in the center) is an area which contains the break down of 200,000 volts of electricity. The two wires on either side are connected to the white gas filled tube. The above reddish sign is not directly connected to the terminals. Click HERE to watch an AVI where the above capture was taken. 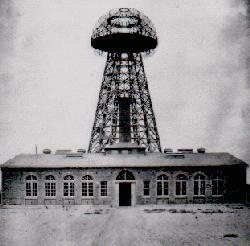 Tesla worked at the Continental Edison Company in Paris designing dynamos. While living in Europe he came up with the design of his AC induction motor and built a prototype and it worked. He traveled from Europe to America in 1884 and started work for Edison in New York. Eventually Tesla and Edison fought over DC and AC. Thomas Edison built his empire on DC, he didn't want to see it be destroyed. The victor of the War of the Currents was AC power. Direct Current(DC) doesn't travel very well for long distances, it grows weaker with distance. AC power is more efficient because it can step up to high voltage. Through time the AC system was to be the only system used for distributing electrical power to businesses and homes. Thomas Edison is credited with the invention of the light bulb and direct current. This is totally incorrect. You saw proof of an ancient Egyptian Light bulb. How can Edison be the inventor, when the ancient Egyptians had it before Edison's parents were even born? The above system was designed by Nikola Tesla and is still in use today. 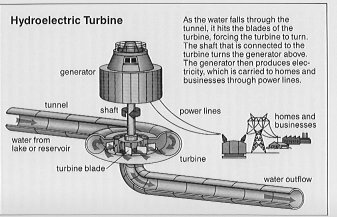 A hydroelectric generator, AC power lines, a Tesla coil to step up to high frequency, distribution power lines, another Tesla coil to step down from high frequency and then electricity is used accordingly. Wardenclyffe, a 154ft tower that was to be topped with a huge copper dome(when completed). Building one every so many miles would transmit electricity wireless all over the world. J.P. Morgan had built one of the largest financial empires of the century. Nikola was invited to Morgan's home. Tesla asked J.P. Morgan for the money he needed to start the Wardenclyffe project. Morgan turned him down. Tesla offered him 51% of the patent rights to his inventions for $150,000.00. Morgan accepted. Tesla was hoping other investors would get interested later on after the project took shape. Nikola ran out of money before it was completed. He went back to Morgan and asked for more money. Morgan loaned it to him. Delays in receiving new equipment plagued Tesla. His motors and dynamos were not easily produced because of their unusual design. Equipment for their manufacture had to be specially ordered. This caused unwanted delays. Tesla sought to have this project completed in nine months. After one year Morgan withdrew because he hadn't seen a return on his investment. His classic argument was, if any one can draw on the power, where do we put the meter? I personally think if we install this system on earth today with modern materials, we can charge for the purchase of an antenna for each customer and a flat rate for the power consumed. Of course the antenna would be a "smart" antenna. It would only allow a certain maximum amount of power to be consumed at any given time. There are ways to implement this technology in a new social structure. Tesla is preceded in greatness only by Michael Faraday who in 1831 rocked the scientific world with his discovery that magnetism can produce electricity...if it is accompanied by motion. Faraday discovered the principle, but not how to make it power the world; Tesla alone accomplished this singular feat. In fact, while you're at it, check to see who discovered the fluorescent bulb, neon lights, speedometer, the automobile ignition system, and the basics behind radar, electron microscope, and the microwave oven. Of course, the ancient Egyptians had the Light bulb before Tesla was born but that's beside the point here. Chances are that you will see little mention of a guy named Nikola Tesla, the most famous scientist in the world at the turn of the century. In fact, few people today have ever heard of the guy. Good old Thomas Edison made sure of that. After all, Tesla was considered an eccentric who talked of death rays that could destroy 10,000 airplanes at a distance of 250 miles, claimed to be able split the Earth in two, believed that both voice and image could be transmitted through the air (in the late 1800's), and essentially told Edison to take his DC electrical system and st-ck it you k-ow w-ere. In other words, anyone that has even heard of Tesla probably considers him to be a first class wacko. But, the times are a changin'. The problem is that Tesla probably could do all these things that he claimed were possible. In fact, Tesla invented every single one of the items listed above (but gets no credit) and much more. Look around you and chances are Tesla is somehow responsible for most of the things that make modern life so modern. No doubt about it, Nikola Tesla is the greatest mind since da Vinci. Tesla had an extraordinary memory and spoke six languages. He spent four years at the Polytechnic Institute at Gratz studying math, physics, and mechanics. What made Tesla great, however, was his amazing understanding of electricity. Remember that this was a time when electricity was still in its infancy. The lightbulb hadn't even been invented yet(of course it has; the ancient Egyptians had it!). When Tesla first came to the United States in 1884, he worked for Thomas Edison. Edison had just patented the lightbulb, so he needed a system to distribute electricity. Edison had all sorts of problems with his DC system of electricity. He promised Tesla big bucks in bonuses if he could get the bugs out of the system. Tesla ended up saving Edison over $100,000 (millions of $$$ by today's dollars), but Edison refused to live up to his end of the bargain. Tesla quit and Edison spent the rest of his life trying to squash Tesla's genius (and the main reason Tesla is unknown today). Tesla devised a better system for electrical transmission - the AC (alternating current) system that we use in our homes today. AC offered great advantages over the DC system. By using Tesla's newly developed transformers, AC voltages could be stepped up and transmitted over long distances through thin wires. DC could not (requiring a large power plant every square mile while transmitting through very thick cables). Of course, a system of transmission would be incomplete without devices to run on them. So, he invented the motors that are used in every appliance in your home. This was no simple achievement - scientists of the late 1800's were convinced that no motor could be revised for an alternating current system, making the use of AC a waste of time. After all, if the current reverses direction 60 times a second, the motor will rock back and forth and never get anywhere. Tesla solved this problem easily and proved everyone wrong. He was using fluorescent bulbs in his lab some forty years before industry "invented" them. 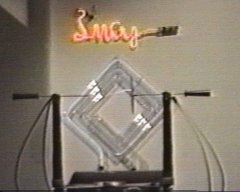 At World's Fairs and similar exhibitions, he took glass tubes and molded them into the shapes of famous scientists' names - the first neon signs that we see all around us today. I almost forgot - Tesla designed the world's first hydroelectric plant, located in Niagara Falls. He also patented the first speedometer for cars. Word began to spread about his AC system and it eventually reached the ears of George Westinghouse. Tesla signed a contract with Westinghouse under which he would receive $2.50 for each kilowatt of AC electricity sold. Suddenly, Tesla had the cash to start conducting all the experiments he ever dreamed of. But Edison had too much money invested in his DC system, so Tommy (Edison) did his best to discredit Tesla around every turn. Edison constantly tried to show that AC electricity was far more dangerous than his DC power. Tesla counteracted by staging his own marketing campaign. At the 1893 World Exposition in Chicago (attended by 21 million people), he demonstrated how safe AC electricity was by passing high frequency AC power through his body to power light bulbs. He then was able to shoot large lightning bolts from his Tesla coils to the crowd without harm. Nice trick! When the royalties owed to Tesla started to exceed $1 million, Westinghouse ran into financial trouble. Tesla realized that if his contract remained in effect, Westinghouse would be out of business and he had no desire to deal with the creditors. His dream was to have cheap AC electric available to all people. Tesla took his contract and ripped it up! Instead of becoming the world's first billionaire, he was paid $216,600 outright for his patents. In 1898, he demonstrated to the world the first remote controlled model boat at Madison Square Garden. So you can thank Tesla for the invention of those remote controlled planes, cars, and boats (and televisions! ), also. Tesla had a dream of providing free energy to the world. In 1900, backed by $150,000 from financier J.P. Morgan, Tesla began testing of his so called "Wireless Broadcasting System" tower on Long Island, New York. This broadcasting tower was intended to link the world's telephone and telegraph services, as well as transmit pictures, stock reports, and weather information worldwide. Unfortunately, Morgan cut funding when he realized that it meant FREE energy for the world. Many stories claim that the U. S. government destroyed the tower during World War One for fear that the German u-boat spies would use the tower as a landmark to navigate by. In reality, Tesla ran into financial trouble after Morgan cut funding for the project and the tower was sold for scrap to pay off creditors. The world thought he was nuts - after all, transmission of voice, picture, and electricity was unheard of at this time. At this point, the press started to exaggerate Tesla's claims. Tesla reported that he had received radio signals from Mars and Venus. Today we know that he was actually receiving the signals from distant stars, but too little was known about the universe at that time. Instead, the press had a field day with his "outrageous" claims. In his Manhattan lab, Tesla made the earth into an electric tuning fork. He managed to get a steam-driven oscillator to vibrate at the same frequency as the ground beneath him (like Ella Fitgerald breaking the glass with her voice in those old Memorex commercials). The result? An earthquake on all the surrounding city blocks. The buildings trembled, the windows broke, and the plaster fell off the walls. Tesla contended that, in theory, the same principle could be used to destroy the Empire State Building or even possibly split the Earth in two. Tesla had accurately determined the resonant frequencies of the Earth almost 60 years before science could confirm his results. Don't think he didn't attempt something like splitting the Earth open (well, sort of). In his Colorado Springs lab in 1899, he sent waves of energy all the way through the Earth, causing them to bounce back to the source (providing the theory for today's accurate earthquake seismic stations). When the waves came back, he added more electricity to it. The result? The largest man-made lightning bolt ever recorded - 130 feet! - a world's record still unbroken! The accompanying thunder was heard 22 miles away. The entire meadow surrounding his lab had a strange blue glow, similar to that of St. Elmo's Fire. But, this was only a warm-up for his real experiment! Unfortunately, he blew out the local power plant's equipment and he was never able to repeat the experiment. At the beginning of World War I, the government desperately searched for a way to detect German submarines. The government put Thomas Edison in charge of the search for a good method. Tesla proposed the use of energy waves - what we know today as radar - to detect these ships. Edison rejected Tesla's idea as ludicrous and the world had to wait another 25 years until it was invented. His reward for a lifetime of creativity? The prized (to everyone but Tesla) Edison Medal! A real slap in the face after all the verbal abuse Tesla took from Edison. Industry's attempt (obviously very successful) to purge him from the scientific literature had driven him into exile for nearly twenty years. Lacking capital, he was forced to place his untested theories into countless notebooks. The man who invented the modern world died nearly penniless at age 86 on January 7, 1943. More than two thousand people attended his funeral. In his lifetime, Tesla received over 800 different patents. He probably would have exceeded Edison's record number if he wasn't always broke - he could afford very few patent applications during the last thirty years of his life. Unlike Edison, Tesla was an original thinker whose ideas typically had no precedent in science. Unfortunately, the world does not financially reward people of Tesla's originality. We only award those that take these concepts and turn them into a refined, useful product. Scientists today continue to scour through his notes. Many of his far flung theories are just now being proven by our top scientists. For example, the Tesla bladeless disk turbine engine that he designed, when coupled with modern materials, is proving to be among the most efficient motors ever designed. His 1901 patented experiments with cryogenic liquids and electricity provide the foundation for modern superconductors. He talked about experiments that suggested particles with fractional charges of an electron - something that scientists in 1977 finally discovered - quarks! Would you like to learn more about the greatest inventor that ever lived? Go HERE.